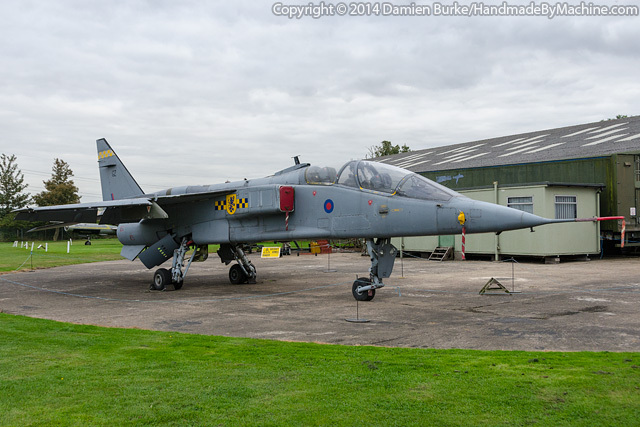 XX829 flew for the first time on 28th November 1974 and was allocated to 54 Squadron in December of the same year. XX829 served with other notable Jaguar squadrons including 6 Squadron, 226 OCU and 16(R) Squadron before being retired to storage at RAF Shawbury in March 2001. Disposed of to Everett Aero, the Newark Air Museum acquired her in March 2012 - the aircraft has a particular poignancy for the Museum's Acquisitions Officer, David Hibbert, who helped maintain the aircraft when it served with 54 Squadron in 1980. Since arrival the Museum have completed the cockpits by putting back the missing ejector seats, but she still lacks engines - I'm sure any leads on a suitable pair would be appreciated!